Firefighters are the guys who stand around at intersections all around Lake Lanier (driving women wild) hoping we’ll pop a few bucks into one of their giant firefighter boots to help families in distress. They’re all nice guys, but we do not want to see them in action — unless it’s our house that catches fire. If we did need them to put out a fire, the seconds we would wait until we heard the first wails of a siren would seem like forever. “OK! Who is on Hose #1? Johnson. OK.
Now, who wants to run down to that fire hydrant and hook up a zillion feet of heavy hoses? Anybody? C’mon! Yes, Billy, you did it last time. Forget that. We expect firefighters to know what to do — without being told every time — and we expect them to do their jobs perfectly every time. Just as if they were the Atlanta Falcons! No, wait. BETTER than the Falcons. Way better. To do that, firefighters practice and practice. 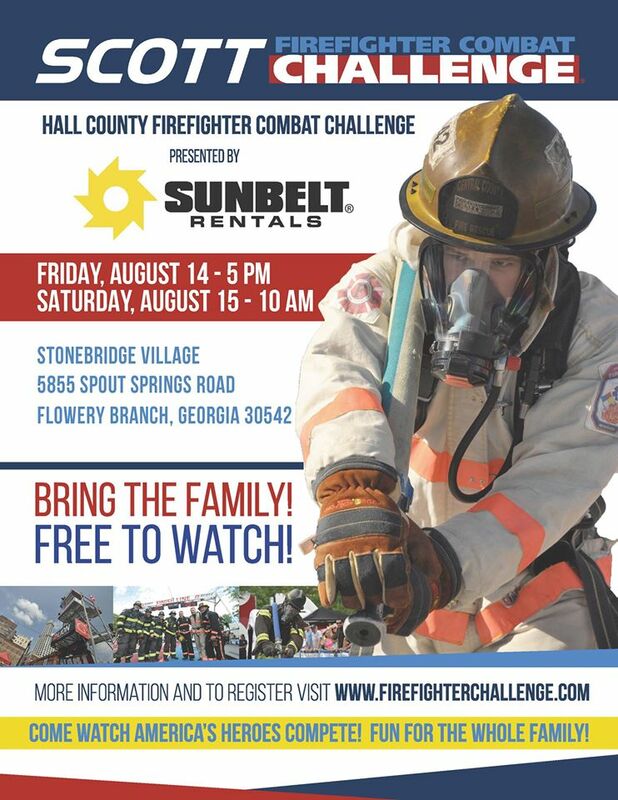 They also take part in competitions, like the Firefighter Combat Challenge August 14th & 15th at Stonebridge Village (Target Shopping Center) in Flowery Branch, that is sponsored by Hall County Fire Services. This exercise will show you how tremendously organized and skilled our firemen and firewomen are as individuals and as teams. Fire departments that do well at this contest might qualify for the nationals which will be televised on ESPN! We are very excited to have some of our local fire fighters participating and hopefully advancing in this very challenging competition. This is a free event, great for families. Saturday, August 1st, Firehouse Subs in Flowery Branch will be accepting donations of 24-pack cases of bottled water. Anyone who brings in a case of water to donate will get a free sandwich at Firehouse Subs in Flowery Branch that day only. The water will be given to local fire stations for people in need when they go on calls and will be distributed at the Firefighter Combat Challenge. Donate some water to firefighters, get a free sandwich and come watch them in action — not at your house — at the Firefighter Combat Challenge August 14-15th at Stonebridge Village (Target Shopping Center) in Flowery Branch. There are sponsorship opportunities for companies/individuals who would like to support the Firefighter Combat Challenge. During the event, donations will be accepted for the Georgia Firefighters Burn Foundation.